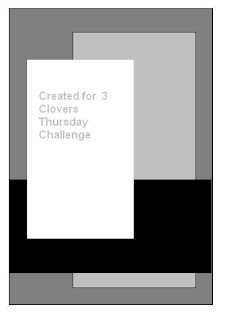 Welcome to Three Clover Thursday Challenges! I'm excited to be part of Kerry's Inspiration Team - I'll be posting my challenges on the odd numbered weeks - you may occasionally see me post of the even weeks too depending on my schedule. This weeks Challenge was a sketch challenge. I can see using this sketch again, even rotating it for a different look. 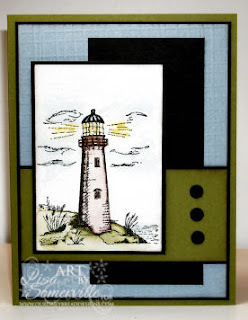 I started out by stamping my lighthouse from Our Daily Bread Designs, in Black Archival on watercolor paper, coloring with the Marker Water Coloring Technique. I stamped the image a second time, cut it out and popped it up for some added dimension. To add texture to the Bordering Blue card stock, I used my Texturz Plates and the Big Shot. If you'd like to play along, here's Kerry's original sketch. This card is gorgeous, Lisa! Lisa- this is a gorgeous card! love the blue and green together to really give the feeling of ocean. Thanks so much for joining me!! Gorgeous card Lisa! You elements care perfect. Love it. I look forward to working with you and seeing more of your work! What a lovely card. I just love Lighthouse images and you've done a fabulous job with this one. It's great to be a part of such a talented bunch of ladies. Beautiful card Lisa!! I really like that image and the colors you used! Looking forward to working with you! Hi Lisa, Tought I'd just subscribe to your blog and then I could comment here and also get instructions on how the card was made! This is a gorgeous card! So pretty! Great colors & what a fun layout to work with! Sorry for the late browsing...just had to tell you that this is a very classy card! Love it!